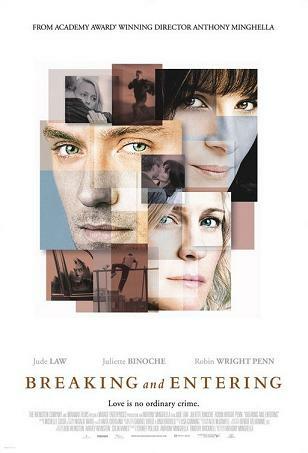 In Breaking & Entering, written and directed by Anthony Minghella, Juliette Binoche plays Amira, a seamstress, who develops a romance with Will (Jude Law), an architect married to Liv (Robin Write Penn). Vera Farmiga plays a prostitute who befriends Will while he spies on Amira's son (Rafi Gavron) breaking and entering into his workplace. Anthony Minghella has previously written and directed Cold Mountain, The Talented Mr.Ripley and The English Patient, which won an Oscar for Best Picture of 1996. I had the privilege to interview him along with Juliette Binoche, Robin Wright Penn and Vera Farmiga. The Weinstein Company will release Breaking & Entering on January 26th, 2007 at the Paris Theater and Landmark Sunshine Cinemas. NYC MOVIE GURU: Where did your idea for Breaking & Entering originate? AM: I starting thinking about the text of this film immediately after 9/11. I was downtown in New York on 9/11 after a decade of having made movies which were adaptations of novels. When you come to make a movie that is an original film, it can’t do anything other than reflect the world that’s going on around you. It’s almost like I was downloading the interim period into a movie [about] the things that we’re talking and thinking about as human beings away from filmmaking. The movie itself was punctuated by the bomb attacks in London, just around the corner from where [Liv] was living. The only editorial implication of what happened was that we removed a shot: Juliette and Jude were in a taxi in the sequence when they’re on their way to their friend’s apartment and we went past a tribute to the bombs of 7/7—people were leaving flowers just by where we were shooting, literally. I just couldn’t live with that in the movie because it felt like we were trying to have more significance or more documentarian characteristics, so we removed that moment. NYC MOVIE GURU: What is your purpose for making Breaking & Entering? AM: I felt that it was very urgent that I try to make a postcard of where I was and go back to something that I thought that was, on some level, where I belonged. One of the tensions for me is the difference between what my pen does and what my camera does. I have very small handwriting and it’s illegible. I think this movie is more like that and my camera is a bit more interested in wider landscapes. It was very good to be around a group of people who were committed to something contemporary and something modest and, in every sense, a lower budget [movie]. People did the movie for very little money. They showed up because they wanted to be in the movie. It was a very different experience and one that I liked a lot. It’s very interesting for filmmakers to make movies and stories in places of change and architects, [like Will], preoccupy with change. AM: I’ve never done as much research as I did for this movie. Every line that we had, some expert patrolled and disagreed with. [We had] analysts, teachers, psychiatrists, Bosnians [and] Serbs. I went to Romania [and] to Sarajevo. It was extraordinary how little I knew, how little I got right about the world that I inhabited. It was quite a party sometimes. In the early days of rehearsal, we had people from the U.N. talking to us about leaving the Bosnian situation. We had the psychiatrist come in and talk to us. We met with police people. It’s hard to get these things right. NYC MOVIE GURU: Juliette, what kind of research did you do for your role? JB: My first instinct was to go to Sarajevo and meet with women in order to understand what they went through in the war, before the war and after the war. Meeting mothers [who] had been through the whole experience was very traumatic most of the time because being inside was hard enough, but going out was even worst. They’re kind of sacrificing their life for their children. As an actor, it’s always a [transformative] journey. First of all, you have to come without knowing and trying to empty yourself in order to receive. I had been through the South African experience trying to understand what they went through and there was another one—it was almost so similar and yet different. I had to understand the differences, so I started from there. I was in contact with a Bosnian woman in London all the time and she made my life much easier because we would sing together and it was a way to reach the rhythm and the love of the language. RWP: I asked Anthony [Minghella] in the beginning, “I’m sure you know some Scandivian women,” and he said, “You know what? Just go to Stockholm”. So, I went for 48 hours. I would interview a couple of people and they said, “You know, most of us are suicidal”. [They] didn’t have a lot of light throughout the year and I asked, “What do you do with that tendency to become alcoholic?” and she said, “Nobody talks about it”. That’s all I needed. I didn’t want to investigate further what were the dynamics between those people and to isolate that culture. I felt like that was a culture in and of itself. To have that feeling every day that you wake up and to be able to transpose that into having a child, that takes all of your energy and all of your focus goes there. VF: I come from a long line of Slavic immigrants who were looking to create a better life for themselves other countries. This one was Romania and I’m Ukrainian, but they’re countries that had similar politics and desires and have been shackled in many ways. Oana could have easier been a cashier. In my mind, she was more of a philosopher, so I didn’t feel the need to turn a few tricks to understand that. I was so drawn to the character [because], often times, as an actor, you’re drawn to qualities in certain characters that you admire. [Oana] was the opposite of myself—she’s got a bluntness and a frankness that I really admired. NYC MOVIE GURU: Anthony, how did you decide which actress would play which role? AM: There’s a version of this movie, I think, where everybody plays a different part. Robin [Wright Penn] could have easily played Juliette [Binoche]’s part and vice versa. And Vera [Farmiga] could have played any of these parts [as well]. The movie celebrates women and incredible actresses. There are so few times when women get to control a film. NYC MOVIE GURU: Would you consider Liv and Will’s daughter, Bea, to be autistic? AM: One thing that the studio kept on asking me and, often, preview audiences kept saying is, “What is wrong with this girl?” and I said, “If we knew what was wrong with her, we’d start to have to fix things.” But the problem with these wiring issues in people’s minds is that they’re not that easy to diagnose. One of the things that Liv says is, “We’ve been to so many people. We’ve never had a proper diagnosis”. The diagnosis is like a relief, so I’m not even sure if this is a child on the autism spectrum—that’s [just] the conjecture. But the idea simply was that there were two special mothers with two special children in the house and to see the extent [that] mothers will go to defend and protect their turf and their child. NYC MOVIE GURU: What brings Will closer to Amira? AM: One of the things that we tried to do was to create a world in which these three people, Liv and Will and their daughter, [Bea], were living which all the blood was drained out of everything. It was designed-to-death, there’s not a single color anywhere. [Liv] wakes up in the morning and [needs] to find an artificial light, but everything has lost its blood. [Will] arrives in a place that’s so full-on and real and simple. He feels oddly more comfortable in that tiny little room that Amira lives in. I didn’t find it odd that he was attracted to her. I think that it’s a moment [like] where that window smashes in the beginning of the movie and then everyone starts looking at each other as opposed to not looking at each other. It’s like they can suddenly see outside of the window and also see inside. NYC MOVIE GURU: What’s the basic message you want people to taking away from Breaking & Entering? AM: One of the things that happened to me in London was when I was a young playwright and couldn’t afford to live in London, so I slept on somebody’s couch for a year. I would get up and, once a year, a cleaner would come. After two or three weeks, I said, “Hello!” to her and she’s a very shy cleaner and [then I got to know her]. I suddenly felt so humiliated that I just thought, “Oh, there’s the cleaner coming in”. I come from a very monochrome culture where everyone was what they appeared to be and, suddenly, I realized I knew nothing about anybody and that anybody arrives with a story. The minute that you go an inch further, you realize that people are extraordinary. Part of the movie is saying [that] before you make a judgment of anybody, find out what their story is.